In many DIY (do-it-yourself) projects around the home and garden, you'd encounter the need to drill holes in wood or concrete. The best way to do this is with an electric or battery-powered drill. You simply choose the right sized drill bit, tighten in on the drill chuck and you're ready to drill away. But how do you ensure that you've reached the right depth for the hole? Some drills now come equipped with a measuring gauge/rule, but what if yours doesn't have one? Here's a tip. Use an old standby - the masking tape. 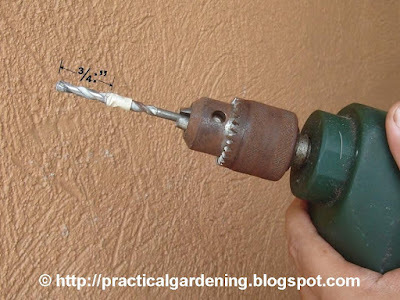 Simply measure the depth from the tip of the drill bit. In the photo below, I'm using a drill to bore a hole that's 3/4" deep because that's the length of the expansion anchor. Cut a short masking tape and wrap around at the marked depth. Run the drill and stop at the point where the first masking tape edge has just entered the drill hole.